Monday October 21. Second sea day. 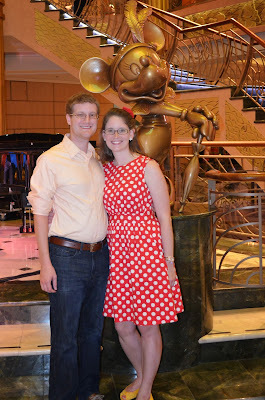 Next day of our Disney cruise was another day to play on the boat. In the morning we had some nursery time scheduled for P so that Andrew and I could go to brunch at one of the specialty restaurants, Palo. 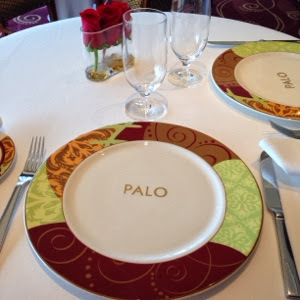 I had read so much about Palo brunch and was a little more than slightly disappointed when I couldn't schedule a reservation for it ahead of time because it was all booked out by the time us first-time disney cruisers could do online booking. 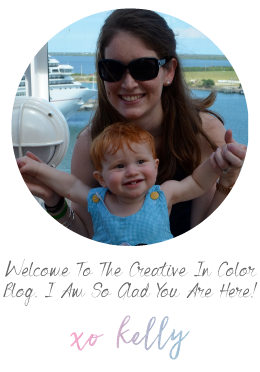 But I snagged one once we got on board. Brunch definitely lived up to its reviews, it was fabulous. 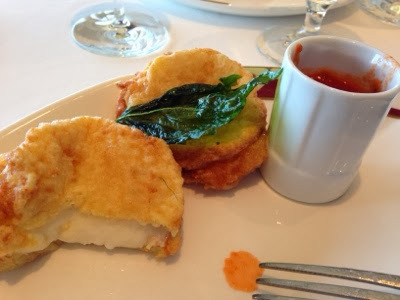 I know some people have issues paying an upcharge for meals on a cruise where your meals are included...but there really is a difference in atmosphere and food quality (not that the other free food is not wonderful). Our server was amazing. 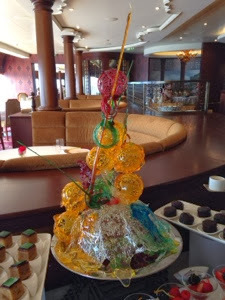 His name was Luco and was from Italy...he gave great suggestions on what to eat and what not to eat (because you could get it elsewhere on the boat...you know don't fill up on pastries and mickey waffles even though they are there). 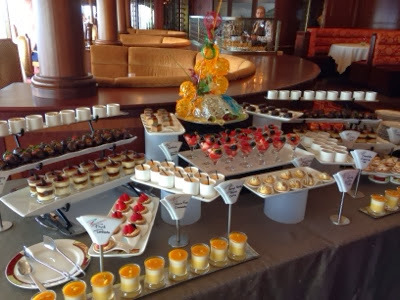 The food was kind of buffet style...with some things out to grab but there were also a bunch of entrees that were made to order. 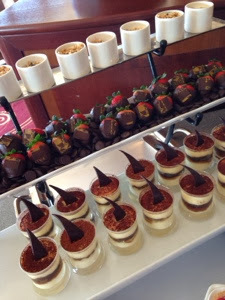 The dessert table was AMAZING. 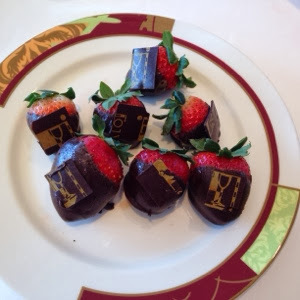 And when I mentioned how much I loved chocolate covered strawberries, Luco instructed me to make a plate full to take with me back to the room...thanks Luco! It was such a fun time going on a "date" together just the two of us and well worth the $25/person upcharge. These are not your every day "mozzarella sticks"
Later that day we passed by during one of the Princess Gatherings. We never stood in line for it...one perk of having a boy. : ) But it was neat to see all the princesses in one place. It would definitely be a magical moment for a little princess. 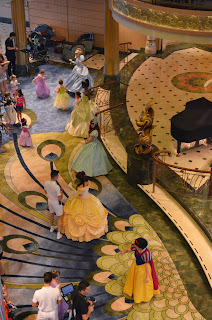 We did go to the afternoon character dance party. Exactly what it sounds like...Mickey, Minnie, Pluto and Goofy all came down and danced with everyone in the atrium of the ship. 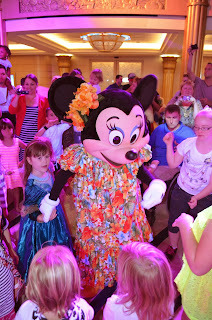 They did a good job of moving around the crowd so everyone got to meet and dance with the different characters. P had a great time watching it all and clapping to the music. So fun. Then we went back to the room for a good afternoon nap and got ready for dinner. It was semi-formal night and we ate in Royal Court, a dining room inspired by the classic Disney movies Cinderella, Snow White, Beauty and the Beast and Sleeping Beauty. Very ornate and pretty. Then it was back to the room to say goodnight and see what artwork our room hostess had made us out of a towel.